Package:One pair of Gloves,left and right. Kindly measure your hand and choose the correct size as per chart. Thanks for visiting Superbike and ride among us. Our core mission is protecting your riding at anytime everywhere. We will be glad to serve you quality product,fast delivery and satisfy service.Please contact us freely if you have any questions or ideas. *Antiskid design on the palm help to hold your motor better. *Genuine brown leather material:soft,flexible,lightweight,durability with long life. *Buckle button can lock the right and left glove together to avoid lost while not use. 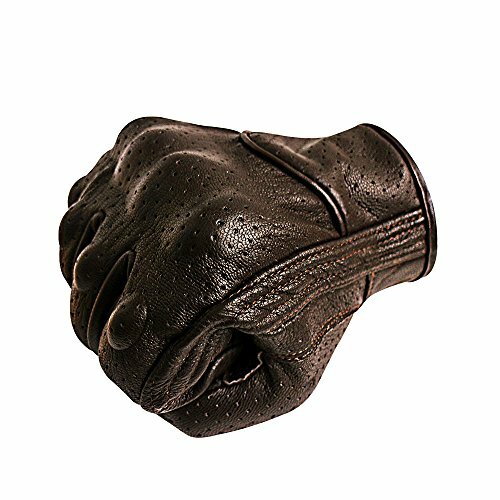 *Hard plastics knuckle and foam padding on the finger help to assure your hand more protection. *Touch screen capabilities on the index finger to use mobile and other device without remove the gloves. Manufacturer: Qingdao Kaiwende Industrial Co., Ltd. Publisher: Qingdao Kaiwende Industrial Co., Ltd. Studio: Qingdao Kaiwende Industrial Co., Ltd. If you have any questions about this product by Superbike, contact us by completing and submitting the form below. If you are looking for a specif part number, please include it with your message.